The PlexiDor Electronic opens when a collar key with the right RFID is close enough. That means, any animal able to wear a collar to carry the key can open it. There are thousands of codes and no risk of a neighbor’s pet triggering the door – only the right code will make the motor in the door pull the panel up. Once the pet has gone through, the door will close automatically. 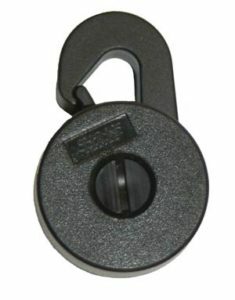 The standard key has a range of 12″ and is 1 7/8″ x 1 3/16″ big. The long range key opens 17″ from the door. This key is recommended for pets with long noses that may have a problem getting close enough with the standard key – and for pets that enjoy running in and out of the house. The long range key is 2″ x 3″ big. The collar keys are waterproof, rugged, and shock proof. They work with underground fencing and will not interfere with home security systems. And, they do not require batteries.